When Qualcomm announced its new Snapdragon 835 chip that was to be foundation of a new era of VR, the world was abuzz with the impending possibilities that this could usher in. After all, the demo headset was just a prototype and a foundation for other manufacturers to build their own headsets on and there was much anticipation in the air since there were already a few contenders in the market who were all set to implement this new technology. This anticipation, though, has now become much more of a reality as Qualcomm has gotten multiple manufacturers on board to work with them on the VRDK reference design, and the first set of new consumer headsets are all set to hit the markets in 2H 2017. The Snapdragon 835 chip is said to be just the tip of the iceberg in what Qualcomm has planned in this industry segment, and it claims to have several more additional features in the pipeline for subsequent enhancements to this chip. However, the 835 is powerful as it is. Suitable for smart phones and tablets, it is also extendable in different directions (if manufactures use a bit of ingenuity). However, it is primarily designed with VR in mind. So what’s have they done to make the chip so perfect for VR? Well, to begin with, Qualcomm has tried to commercialize VR HMDs in a much shorter span of time with lower resource restraints. This is the core of their HMD Accelerator Program by means of which they plan to use their expertise to now just create headsets on their own but to help companies build their own VR headsets, using the hardware Qualcomm provides. This is not an absolutely new idea since Intel launched their Project Alloy reference headset too. The months to come will let us know whether Qualcomm or Intel will forge ahead to rule the VR segment. While Intel certainly did have its share of the market over the years, sturdy contenders such as Qualcomm are certainly giving them a run for their money. For instance, consider awhile Qualcomm’s HMD Accelerator Program. At its root is the VRDK reference headset which is based on the Snapdragon 835, a powerhouse at the word go! The all-in-one reference headset features a 90Hz 2560 x 1440 AMOLED display, inside-out 6DOF tracking, 4 GB of RAM, 100 degree field of view, hand tracking and eye tracking. Qualcomm has teamed up with Leap Motion for its new mobile sensor for tracking, making it a complete package that a consumer can use without the restrictions of a smart phone or a PC. 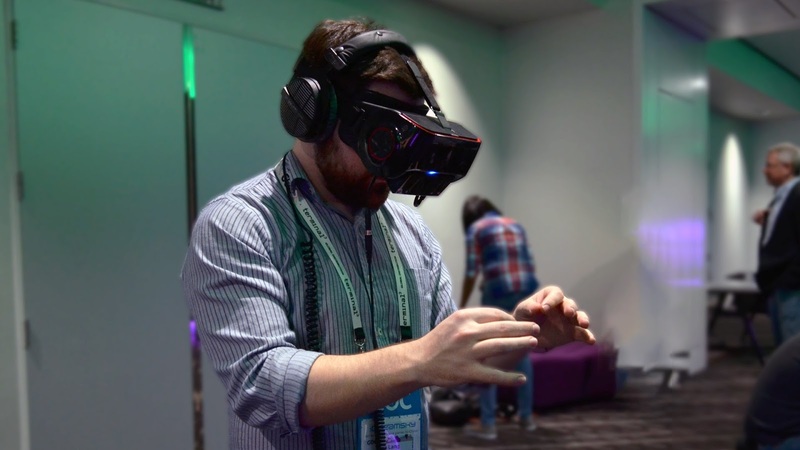 With all of this power as part of the VRDK, companies can use it as a starting point to build their own VR headsets and move forward from there to create something that is uniquely their own, but based off of Qualcomm’s underlying technologies and hardware. According to Qualcomm, Thundercomm and Goertek were the first ODMs (Original Device Manufacturers) to team up with them for the HMD Accelerator Program and both companies are planning to offer their manufacturing services for any OEMs who desire to build and sell a VRDK-based headset to their customer base. These are ready to be launched as early as 2H 2017. Qualcomm has additional plans for its VRDK headset and technology – the company plans to distribute it to content creators who can take it forward to stimulate an entire ecosystem of applications that can fully push the VR headsets and the Snapdragon 835 platform to their complete potential. Developers will get their hands on these headsets, says Qualcomm, in Q2 2017. What makes this platform so powerful, you may ask! Well, all-in-one (AIO) headsets are way superior over Gear VR and other mobile shell headsets because they come with constraints where a host smart phone should be connected to the headset. AIO headsets, on the other hand, are not restricted to either this connectivity or the limitations that are part of a smart phone design. Additionally, these headsets can be created optimally for VR so that consumers enjoy an outstanding VR experience since the headphones already contain all the hardware that a smart phone uses for the same purpose. While they may end up being as costly as a smart phone, for a VR enthusiast, this is an investment that is well worth it. On the point of pricing, Qualcomm and its partners have not spoken about possible costs. The months to come will give us an idea of where the price point falls and how soon it hits mainstream levels. Varun Kumar Works for LatestOne.com as Content Writer. It is the e-tailer Company known for bringing the Mobile Covers|Wrist Watches|Bluetooth Speakers|Power banks models from all major manufacturers at best discounts. The company has a fully operational office and warehouse maintained to make timely deliveries across the nation.